Stocks are enjoying a relief rally to open the week on Monday but make no mistake: the volatility that’s been in play in recent weeks isn’t going anywhere. This looks and feels like a very short-lived reprieve ahead of more fireworks. So many major headwinds are still in play, from awaiting China’s response to President Donald Trump’s announcement of another $100 billion in trade tariffs (for a total of $150 billion) to the ongoing pressure of Federal Reserve policy tightening and now fears that the global economy is about to slow its pace of growth. To this list, we now add the threat of a U.S.-led airstrike on Syria in retaliation for an alleged chemical weapons attack. Something that in turn carries the threat of retaliation by Syria’s allies in Iran and Russia. If all that wasn’t enough, we are also facing the start of the first-quarter earnings season, with analyst expectations sky high. 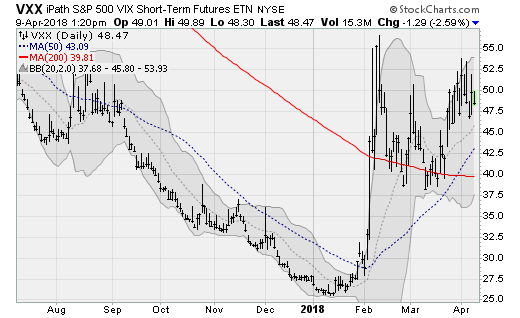 Tied to the underlying CBOE Volatility Index (CBOE:VIX), known as Wall Street’s “fear gauge,” the VXX has been pushing persistently higher since the middle of March as market turbulence has returned and the easy-going conditions investors enjoyed from late 2016 through early 2018 seems to have vanished for good. The VXX spiked in early February as billions in short-volatility trades were unwound violently. Watch for a further breakout as years of lazy assumptions that markets would only ever rise gently are being shaken as the main support of that dynamic — Fed policy easing — is now being aggressively reversed not only via interest rates hikes but “quantiative tightening” as well. The all-important S&P 500 ETF (NYSEARCA:SPY) the SPDRs, are some of the most actively traded exchange-traded funds in existence. Their importance, as well as that of the underlying S&P 500, is the reason the index continues to trade around key technical support and resistance levels. 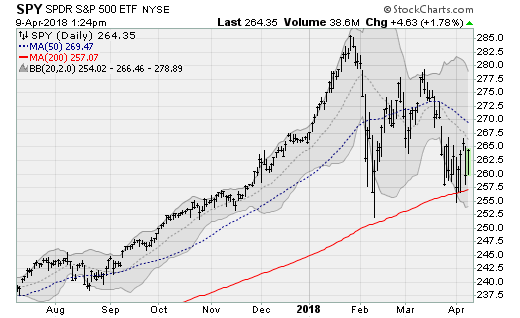 A double top in late February and mid-March has led to yet another test of the 200-day moving average and oscillations around the 260 level — corresponding to the 2,600 level on the S&P 500. Watch for a break of the 200-day average, which hasn’t been traded below on a significant basis since early 2016. 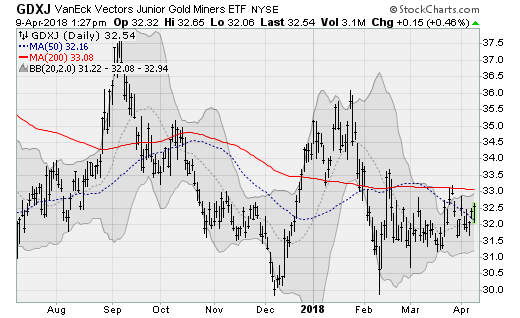 I continue to look for a rally in precious metals such as the VanEck Junior Gold Miners ETF (NYSEARCA:GDXJ) in the near term on safe-haven inflows. The specter of both a trade war and an actual shooting war (in the Middle East and in the South China Sea) should drive inflows into gold and silver in a way that hasn’t been seen in years. Moreover, with interbank lending rates rising fast as the Federal Reserve tightens its grip on money markets, watch for the reappearance of credit market risk with default rates set to rise and, thus, increased worries about the health of the banking system. 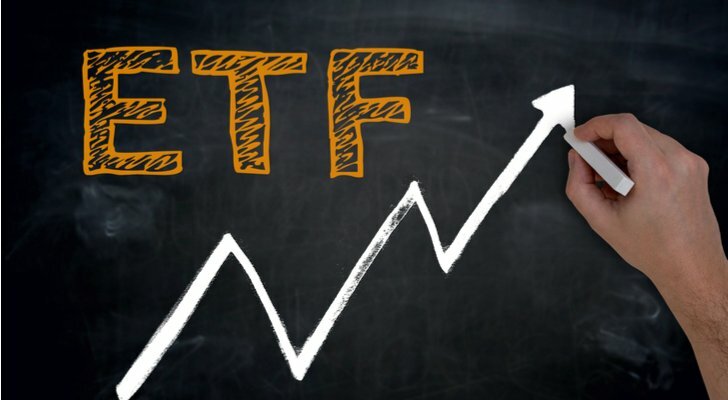 The iShares China Large-Cap ETF (NYSEARCA:FXI) is tied to a collection of large-cap Chinese equities including Tencent and the Industrial and Commercial Bank of China. 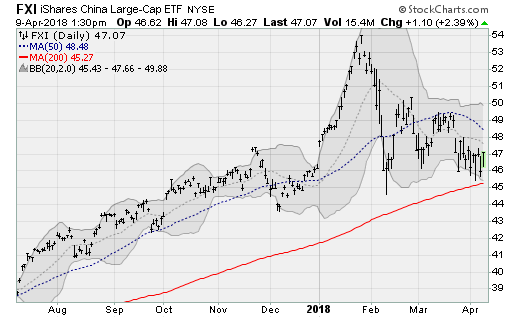 The ETF is down 13% from its late January high and looks set for a move below its 200-day moving average as trade tensions continue to worsen. The FXI enjoyed nearly a double drop its early 2016 low, which was the last time the fund traded deeply below its 200-day average. At the time, the selling was driven by currency devaluation fears as well as concerns about China’s unresolved bad debt problem. Article printed from InvestorPlace Media, https://investorplace.com/2018/04/4-etfs-to-watch-amid-global-geopolitical-tensions/.